Castlebar - County Mayo - Hollywood actress Mischa Barton comes to Castlebar! 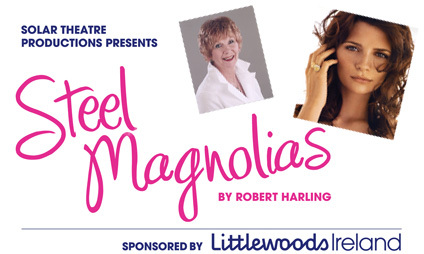 Hollywood actress Mischa Barton (The Sixth Sense, The OC) makes her Irish stage debut as Shelby Eatenton, and Anne Charleston (Madge Bishop in Neighbours) plays Ouiser Boudreaux in this all-Ireland Stage Touring Premiere of STEEL MAGNOLIAS. Directed by Ben Barnes, the original play tells the heart-warming story we came to love on film. An enduring tale of love, loss and friendship, we follow the lives of six Southern women who come together in Truvy’s exclusive Beauty Parlour. Full of wise-cracking repartée, the women are witty, intelligent and sometimes slightly crazy. Annelle, who’s not sure if she’s still married, is the eager new assistant to the outspoken romantic Truvy who dispenses shampoo and free advice to the town’s rich curmudgeon and dog-loving Ouiser, eccentric millionaire Miss Clairee and classic Southern mother M’Lynn, whose pretty daughter Shelby (a diabetic) is about to get married. Opening on Shelby’s wedding day, the story moves towards tragedy when she risks pregnancy. The beauty and fragility of her life has a profound effect on all the women, and their underlying strengths of love and friendship make this play truly touching to behold. Packed with 1980s nostalgia and memorable one-liners, Steel Magnolias is the funniest play ever to make you cry. Directed by Ben Barnes and and the best night out at the theatre in a long time. Tickets on sale from Ticketmaster outlets online & nationwide and from the Royal Theatre Box Office on 0818 300 000 or 094 90 23111. Tickets are priced at €25.65.